Universities, carmakers, local authorities and tech and insurance firms are involved in an array of part-government-sponsored self-driving vehicle pilots across the UK. More than £20m is being funnelled into projects to build and refine autonomous technology, understand human-vehicle interaction, and assess risk. It’s an era described as the "Kitty Hawk" moment for robot cars – a reference to the moment in 1903 when the Wright Brothers made their first powered flight in North Carolina. What followed was a blossoming of ideas in aircraft design, technology and new companies. In June, British supermarket retailer Ocado jumped into the fray, partnering with Oxford University spin-out Oxbotica on a 10‑day pilot of CargoPod. CargoPod is an electric, self-driving vehicle that ferried goods for 100 customers on a 3km route around Greenwich at a top speed of 5mph (8kmph). CargoPod was based on technology in one of those government-supported projects – GATEway, whose bug-like-shuttles have been trundling around Greenwich since October 2015 running on Oxbotica’s Selenium autonomous operating system and its Caesium Microsoft-Azure-based shuttle management system. Ocado’s debut marked a turning point in Britain’s many driverless trials: an actual, potential end user as opposed to those making the technology. As the UK’s only purely online supermarket, Ocado has prioritised technology investment in a way not common among others. Ocado’s entire web shop, order management and supply chain runs on cloud – AWS for compute and Google for data – which forms its so‑called Ocado Smart Platform. Developing and expanding this is Ocado Technology, a unit of 1,000 people spanning the UK, Spain, Poland and Bulgaria. The division operates on a philosophy of "10X" – seeking projects that improve Ocado revenue by a factor of 10. Ocado claims more than 200 patent applications across 50 separate inventions in more than 15 jurisdictions. One of the latest is a 4G‑based communication network using unlicensed 5GHz for point-to-point communications of up to 10 times a second at its latest warehouse in Andover. Ocado is keen to not only use but also license the technology for use in vehicle-to-vehicle communications. And therein lies the challenge. What is “practical” for an enterprise like Ocado? The national and gadget press were predictably left awed at the prospect of driverless Ocado deliveries. But, first things first. There has been a lot of hype about driverless techin the UK and US as carmaker after carmaker has teamed up with tech firms and universities on technology and pilots. The goal is level-five automation – where the vehicle performs as if being driven by a human. These categories were laid out by the US Department of Transportation’s National Highway Traffic Safety Administration (NHTSA, here) in 2013 but updated three years later to accept the guidelines of the SAE International (initially established as the Society of Automotive Engineers), a group spanning manufacturers in the aerospace, automotive and commercial-vehicle industries (PDF here). 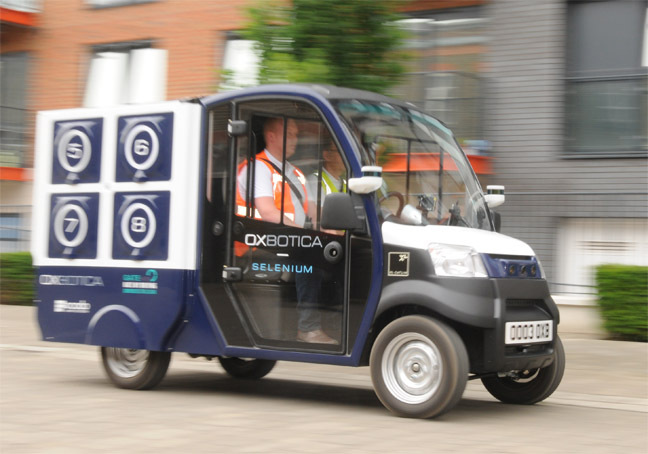 Oxbotica chief executive Graeme Smith told The Reg that the goal is for level four or five autonomous driving in a city environment by 2019 – another two years away. Currently, says Smith, the firm is "95 per cent there"; that final five per cent is “complicated”. CargoPod’s shuttle relatives on the GATEway project have been designed to operated at "level four" – the system can perform all the safety-critical driving functions and monitor road conditions for the whole trip. In reality, however, they are being used in level-two mode – with a driver who doesn’t intervene unless something goes wrong. Critically, for level four, the vehicle must run within its “operational design domain”. Translated: it must be prepared to handle every driving scenario it knows or has been designed for – meaning, by the book, level four does not cover either unexpected situations or unknown terrain. Smith said: “Getting to 95 per cent is relatively easy – getting to the final five per cent is much more complicated and a lot of that comes down to being here [in Greenwich] – collecting data, taking it away and figuring out what happened.